We left the Botanical Gardens at Batumi in bright sunshine and to hearty waves from the cafe staff. The car park attendant looked particularly chuffed when we have him an extra 5 GEL. He had charged us 2 to park overnight, made sure we were tucked away for the night and buttoned up and introduced us to the local bobby. All for about 70p. The road was OK but very wiggly. Georgian drivers are notoriously nutty. So on tiny roads winding up steep hills they tear past flashing their lights at the oncoming truck like phasers as if that will somehow make it vanish. I am sure that if we had another cost of paint on the front we’d have it scraped off by now! Georgia’s not a tiny country but has very few roads. Imagine England, with just the A1, A14 and M4 as the only surfaced roads in the country. Add to that the fact that the large tracts of the rest of the country is a luscious green and where do you think the cows stand? Not by the road but on it. Do the Georgians slow down? Do they hell! The cars swerve inches past the noses and swishing tales of the animals who continue gently chewing away oblivious to the near death experience. It is little wonder that they have a low life expectancy (cows and people alike) with one of the highest accident rates in the world combined with the chain smoking. The countryside along the coast is beautiful and very fertile. The towns though are often like scenes from a war film. The roads become almost impassable and the buildings are falling down. You do see some lovely buildings though and the unkind hand of communist architecture is only an occasional blight, not the wholescale obliteration we saw in eastern Europe. With a lot of money and considerable work this area would become gorgeous. 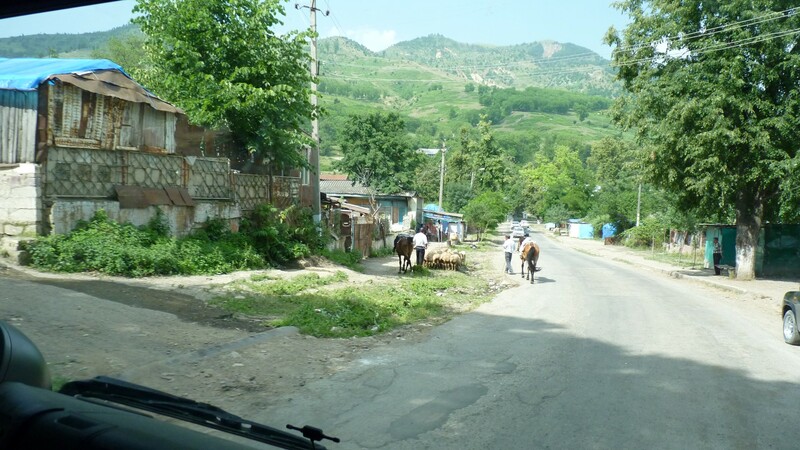 We left the coast road just south of Poti and headed inland to Tbilisi. The road passed through miles and miles of long villages joined seamlessly to one another. All a series of old 2 story houses with tin roofs and tin cladding over the walls. Its hard to judge the age but they all had well established gardens so may well be pre communist and would in their day have been lovely. We eventually reached Khashuri- the beginning of what we have termed the badlands- and immediately came to what looked like a bombed out bridge, presumably from the Russian conflict a few years ago. A bailey bridge took us past the remains of the bridge piers which looked like they were in slow motion states of collapse. We decided that asking the police if it was safe here would be insulting. The road was busy, well kept and had numerous police vehicles on it, so sod the FCO we drove on. The road passed numerous refugee camps – housing those made homeless from Abkhazia and South Ossestia and eventually became a full blown motorway. The camps would not have been Kate Adie TV news material. They were neatly ordered rows of small single story houses resembling the British post war prefabs. They had large gardens, asphalt roads and most had a car. There seemed to be some kind of main large building at each camp, possibly a school. We reached Tbilisi and being Lindas birthday in the morning found a quiet motel TIR lorry park to stay in for a couple of nights. We parked up at the rear of the motel which looked as though it should have been condemned a century ago. We overlooked a small field with daisy the calf not aware of how lucky she was to be grazing in a field! It was quite nice. During the course of the evening the Turkish lorries turned up and so did some questionably dressed ladies and It turned out to be a brothel! Happy Birthday Linda!